AUSTIN, TX--(Marketwired - Apr 15, 2014) - SolarWinds (NYSE: SWI), a leading provider of powerful and affordable IT management software, today announced that controllers have been put down, computer screens have gone black, and bandwidth has been given a reprieve as the 2014 Gaming Bracket Battle comes to a close. Starting with 34 of the most popular and revered video games, and with 4,600+ votes cast by the thwack® community, only Doom survived the final showdown. The second annual SolarWinds® Bracket Battle featured a "March Mayhem"-style competition among iconic arcade, console and computer games. Driven purely by community votes, the Bracket Battle led to heated debate and a few Intimidating Shouts, but "Leeroy Jenkins" was kept in line across SolarWinds' thwack community and beyond, with fan bases taking to Twitter®, Facebook® and other message boards to mobilize their troops. In the end, however, Doom won through its first-person sharp shooting prowess, fearlessness and adaptability. 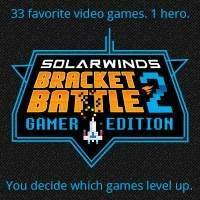 In 2015, SolarWinds' Bracket Battle 3.0 will return with 34 new challengers poised for dominance. But will the 2013 winner, Star Trek®'s Spock®, make a heroic return to defend his title or will a new genre create controversy among loyal fan bases? Stay tuned to thwack to find out more.